James Harden did his coach no favors earlier this season. 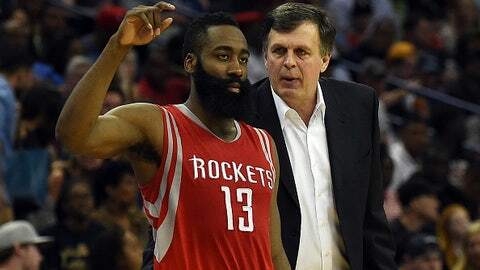 The Houston Rockets fired Kevin McHale 11 games into the 2015-16 NBA season, a move that shocked just about everyone. They were 4-7, but had made noticeable strides in each of his four previous years as the team’s head coach, culminating in an unlikely Western Conference Finals cameo against the Golden State Warriors last spring. Harden currently leads the NBA in minutes and is averaging a career-high 27.9 points per game. But his True Shooting percentage is the lowest it’s been since his rookie season. Harden’s scoring average was fine in those first 11 games (27.3 points per game), but he made only 37.2 percent of his field goal attempts—a deplorable number—was extremely careless with the ball and resembled a splintered screen door on defense. He wasn’t good, and the Rockets have yet to turn things around since deciding McHale was their only issue. After Tuesday night’s collapse against Golden State, Houston is now 27-27 this season. If the season ended today, they’d face the Warriors in the first round of the playoffs. It’s been ugly, and now we know why.